1.Prepare Kale Salad: In large bowl, whisk oil, lemon juice and salt; add kale and massage with hands 3 minutes or until kale begins to wilt and soften; refrigerate 30 minutes. 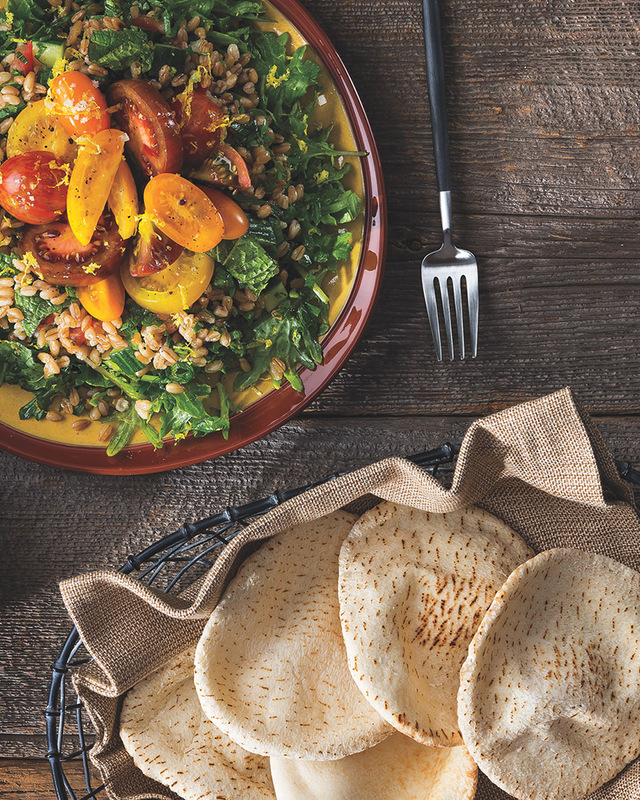 2.Prepare Farro Tabbouleh: In medium covered saucepot, heat 2 cups water and farro to a boil over medium-high heat; reduce heat to low and simmer, covered, 12 minutes or until al dente. Drain, if necessary; cool. Makes about 1-3/4 cups. 3.In large bowl, whisk lemon juice, shallot, honey, 1/2 teaspoon salt, harissa, pie spice and turmeric; whisking constantly, slowly drizzle in 1/4 cup oil until emulsified. Add parsley, mint, pepper, farro and remaining 1/2 teaspoon salt; toss until combined. Let stand 10 minutes; fold in cucumber. 4.In medium bowl, toss tomatoes, lemon zest and remaining 1 teaspoon oil. 5.To serve, layer kale salad, farro mixture and tomato mixture on plate. with olive oil. Or, visit our blog to pair it with our simple-to-make Roasted Eggplant Dip. > Move aside quinoa; farro, an ancient grain high in fiber, is quickly gaining popularity. Try adding farro to soups, salads, or even making a special twist on classic Italian risotto.